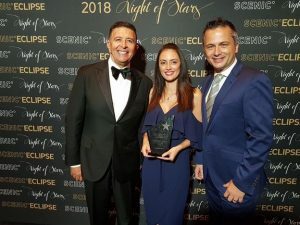 Scenic’s annual ‘Night of Stars’ awards were held on Saturday (3 February) in a glittering black-tie event that was hosted at the Ivy Ballroom in Sydney and recognised the achievements of Scenic’s top performing travel agencies and consultants in Australia and New Zealand. For the fourth consecutive year, the award for top performing home-based agency network was awarded to TravelManagers Australia. TravelManagers’ Executive General Manager, Michael Gazal, says the award serves to further cement its position as Australia’s premium travel network, and cites the commitment of its 500-plus personal travel managers (PTMs) to delivering personal and consistent service as being key to its ongoing success. TravelManagers’ Sandra Reucker and Tanyu Cilek, pictured with ‘Night of Stars’ MC Vince Sorrenti (left), are all smiles at once again being number one for National Home-Based Sales. Gazal goes on to emphasise the importance of strong and effective supplier relationships in the company’s consecutive wins.